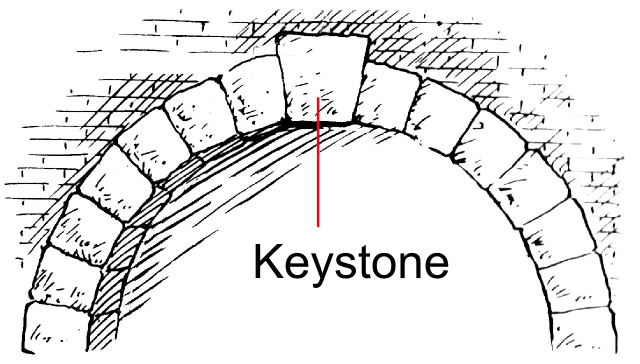 In architecture, a “keystone” is the centermost stone in an arch that supports all of the other stones, yet carries the least amount of weight. In Charles Duhigg’s book, The Power of Habit, he introduces the idea of a keystone habit, a habit that helps hold other good habits in place. Keystone habits lead to the development of multiple good habits. They start a ripple effect in your life that produces a number of positive outcomes. The development of keystone habits can become a critical part of your personal development journey. For example, my keystone habit is getting up early. When I wake up early, I am more consistent in spending time nurturing my spiritual life and more disciplined in my exercise and eating habits. For some reason, when I get up early I think better, write better and am more productive. My keystone habit sets off a chain reaction of internal events giving me the willpower, momentum and ability to generate other positive habits. Simply getting up earlier is a trigger habit that sets off an avalanche of transforming change in my life. Duhigg talks about forming keystone habits to get what you want out of life. You don’t have to change dozens of habits to get to your goals. You only have to change a few keystone habits that will have a ripple effect on your outcomes. Research demonstrates that keystone habits have a similar transforming effect on businesses and organizations. Duhigg cites the story of how CEO Paul O’Neill transformed Alcoa Aluminum Company by focusing on one keystone habit, worker safety. “I knew I had to transform Alcoa,” O’Neill said. “But you can’t order people to change.” “That’s not how the brain works. So I decided I was going to start by focusing on one thing, worker safety. If I could start disrupting the habits around that one thing, it would spread throughout the entire company.” Within a year, Alcoa’s profits would hit a record high with a dramatic increase in worker safety. Establishing an organizational habit of suggesting safety improvements had created other habits, as well, such as recommending business improvements that otherwise would have remained out of sight. By shifting worker safety habits, O’Neill had created patterns of better communication. A chain reaction started that lifted both worker safety and corporate profits. O’Neill’s success at Alcoa is just one example of an organizational keystone habit, a pattern that has the power to start a chain reaction, changing other habits as it moves through an organization. How might the concept of keystone habits translate to the local church? Keystone Habit or Keystone Value? In church circles we are more accustomed to talking about church culture than church habits, but they are similar in many respects. In fact, organizational culture may be defined as an underlying set of values and habits. Thinking of keystone habit as keystone culture can provide a blueprint for transforming church culture. Further, prioritizing this keystone value created the leadership base to launch a multi-site campus strategy that now includes six campuses. What Are Your Church’s Keystone Values? When we attempt to list the church values we want to build, they can become so numerous and overwhelming that we don’t know where to begin. Remember, some church values are more important than others because they have the power to transform your church. A keystone value is the most essential value you can develop. Finding the right keystone value can become a catalyst as it provides the soil from which other desired church values can grow. Identifying the right keystone value, then embodying that value can act as a pillar for further good value development. What are your church’s keystone values? Find and focus on them and then watch transformation take place right before your very eyes!